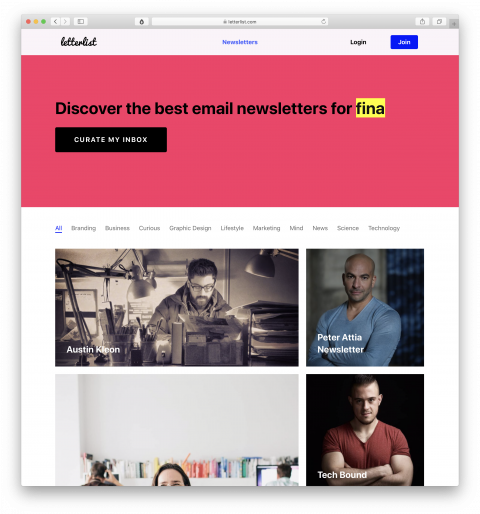 Letterlist allows you to find newsletters based on your interests. I signed up for a few new ones. I’m sure they are just starting and so there are some things to work out, but I have to laugh- you can only join if you put in a 16 character password. SIXTEEN characters. Also, their terms of reference link doesn’t work, nor does their contact link. Not your fault at all, my only hope is that they click over here to read this comment and considered change those three things. Seeing as there is currently no other way to contact them to ask about any of the above. Thanks so much for your comments – it always helps to have an extra set of eyes to help spot things I’d missed or not even considered. I’d accidentally set the contact and terms pages to display only to logged-in users and I’ve fixed that now. As for the password length, it’s a tricky security decision and I need to give it more thought. If you have anything else you need, ping me in the (now accessible) contact page. Thanks for helping out. Glad I saw this when I did – that was an embarrassing oversight.